According to the old saying, one man’s trash is another man’s treasure. Unless the trash hasn’t been properly sorted or put in the correct bag or bin, in which case it’s just a nuisance that must be corrected. 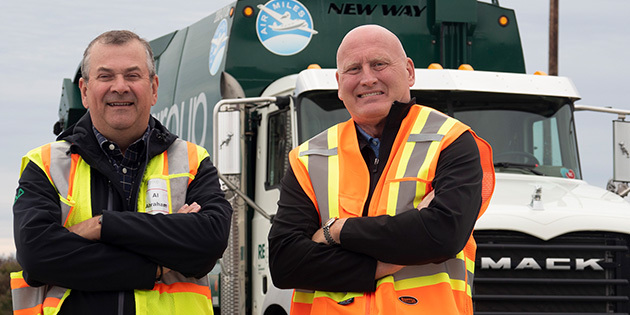 “Nova Scotia has one of the most stringent recycling programs in all of North America,” says Alan Abraham, vice president of Royal Environmental Group (known as REgroup). That emphasis on reducing waste makes REgroup’s more complex. Waste collection is obviously a serious business in the Halifax Regional Municipality, with four types of residential collection and the expectation that the collection streams can’t be commingled. That means the waste collection services have to be trash cops and monitor what goes into the bins and bags. If the wrong materials go into the wrong bag, then the trash is rejected and left on the curb, and the customer is responsible for repackaging it. “We are responsible for the quality of the product that goes into the trucks,” Abraham says. With all this pressure added to the normal high-stress demands of the refuse industry, the last thing REgroup needs is an unreliable truck. Which is why the fleet relies so heavily on Mack® Granite® MHD and TerraPro™ models. Parts of Halifax have narrow, congested streets which rules out the use of side loader units. Instead, the company uses Granite MHD models equipped with rear loaders for residential collection. Each truck has a driver and a loader. It also uses TerraPro models equipped with top loading recycling bodies and TerraPro front end loaders for commercial and apartment collection. The urban conditions of Halifax mean the drivers have their hands full with traffic, pedestrians and cyclists. That makes safety a prime concern. Mirrors, visibility, backup cameras and moving away from manual transmissions are important to improving safety. Abraham says he “can’t remember” the last time the company bought a truck with a manual transmission. This also helps recruit new drivers. Safety officers and route supervisors observe drivers out in the field. The company tries to observe every driver on a consistent basis, to recognize when they do things well and to educate on problem areas, Abraham says. REgroup has grown through multiple acquisitions, which means it operates a variety of truck makes, but the Mack nameplate is predominant, with about 200 units in the fleet of 450. The acquisitions have also moved the fleet into new operating areas, such as the surrounding villages, coastal towns and summer homes. REgroup is open to new ideas and technologies, according to Earl MacLean of MacKay’s Truck Center, the local Mack dealer in Dartmouth, NS. In addition, the fleet is proactive with maintenance and is willing to invest in the trucks to ensure the uptime and productivity they require. Weather is a major factor in the need for tough, durable equipment. Regular large ­temperature swings and nasty winter weather make driving a challenge. Winter weather also leads to regular applications of road salt, the bane of vehicles everywhere. REgroup tries to wash its trucks a number of times a week, to keep them clean and to prevent corrosion. “Rust proofing is very big here in Atlantic Canada,” says Abraham. “We use more salt per mile in Nova Scotia than any other province in the country because of our freeze-thaw cycle, and it is highly corrosive. It is just brutal on equipment.” The Macks in the fleet do well in this environment, he says. “[Mack is] a brand that I think shows to our customers and the public that we’ve invested in good equipment, the toughest equipment. Mack is a work truck.” Alan Abraham, vice president of Royal Environmental Group. Corrosion can also attack wiring and electronics, which is a bigger issue as the fleet has added devices and components to its trucks, such as multiple cameras and GPS. With the corrosion issues related to road salt and the proximity of the North Atlantic’s sea air, Mack’s BodyLink III wiring harness is a real advantage, since it permits fleets and body builders to attach the peripheral devices without splicing into the wiring harness and compromising the integrity of the system. All trucks have GPS, and route supervisors monitor snow clearings and traffic in real time. Abraham stresses that the importance of on-time pickup is why Regroup is a vital service. Caption: (Left) Alan Abraham, vice president and (right) Glen Lane, director of operations of REgroup.